Okay, fine…Halloween wasn’t my inspiration. It was all that kokoshnik-talk from a couple of weeks ago. Remember how the traditional peasant kokoshnik was likened to the French hood? Well here We are…and so are you. pants on, we’ll get to the snood. In the meantime, just laugh at the name. I will…) But let’s start simple with the French hood…it’s Tuesday, after all. 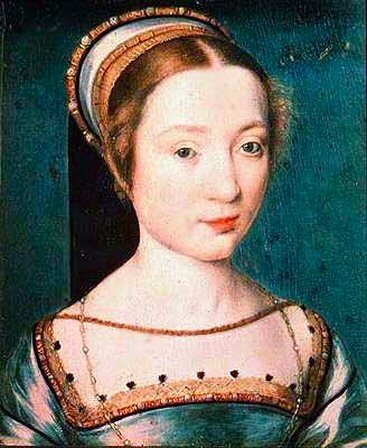 The French hood was introduced to England primarily by Anne Boleyn (leftsies! ), who had been raised in France. As a result, the hoods were referred to as being “in the French style” thus the evolution of the name. (More ‘duh’ anyone?) 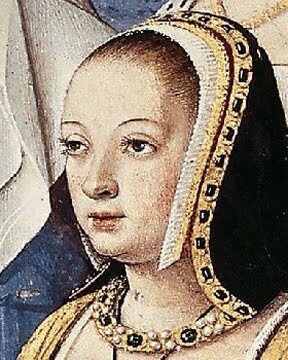 To nobody’s surprise, the French hood was rejected by Anne’s successor, Jane Seymour, under whom the English hood returned to vogue at Henry VIII’s court. After her death, the French hood became the headgear of choice at Hampton Court anew. 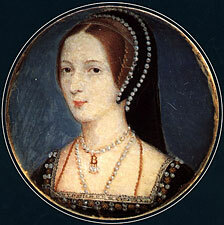 It was also championed by Anne Boleyn’s cousin and fellow ill-fated wife of Henry VIII, Katherine Howard. 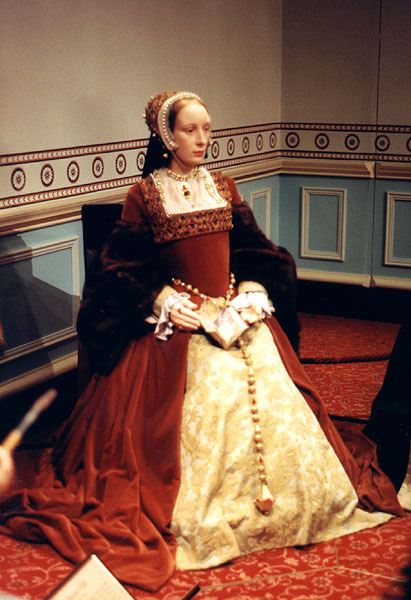 Playing Anne Boleyn wasn’t as Oscar-caliber as you thought it would be…awww. At least you had that psycho ballet movie. At one point the left picture was tentatively “verified” vis-à-vis the necklace she’s wearing which supposedly matches one listed in her personal jewels by court officials. We’re still not convinced. This is information found on Wikipedia. Do you know what your Blog Hostess does for mischievous procrastination? She changes information to the outlandish on Wikipedia. Seriously, if somebody isn’t reading close enough to notice Dolly Madison wasn’t born in 1952, they’ve got much bigger problems. Either way, it makes you wonder how accurate this wax sculpture is. The court of Versailles was not the only one to tie politics up with fashion. It wasn’t the first and I doubt it will be the last. Whichever of the two hoods was en vogue was dictated primarily by Henry VIII’s current queen. Just like Marie Antoinette’s love of the repugnant hue of puce, everyone clamored to wear whichever shape hood the Queen of England was wearing. 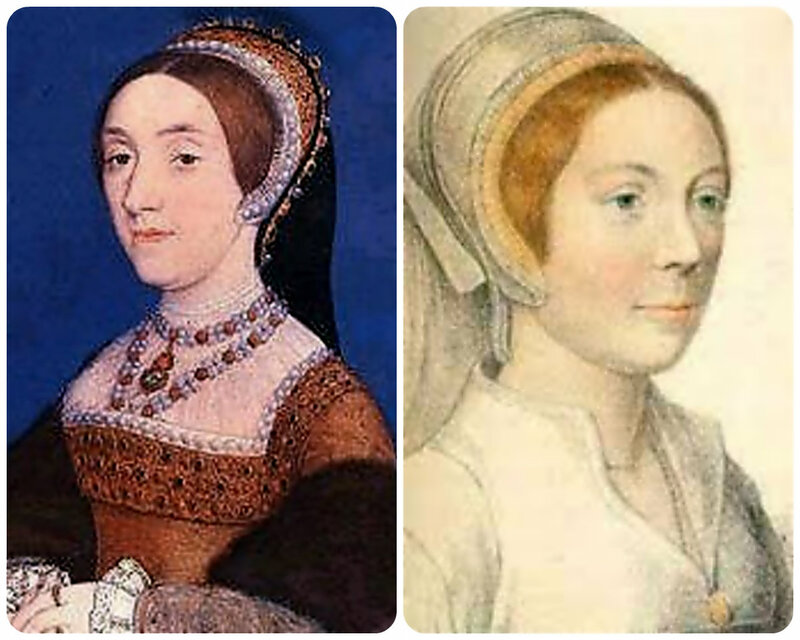 So what was everyone wearing when Catherine of Aragon and Jane Seymour were Queen Consorts? It’s not as elegant but just as political. Hang tight for the English Hood. It’s like wearing a bird house on your head! Yayyy! Who hasn’t dreamed of that? This entry was posted in england, france, historic royals, period fashions, tiara time! and tagged Anne Boleyn, French hood, tiara time, Tudors. Bookmark the permalink. Oh! That Nan Bullen. Always showing off. Cat Howard–even though no one really knows what she looks like, folks swear it’s her ghost fleeing down the haunted gallery at Hampton Court. Screaming. I did make one of those French hoods once. how did it turn out? You wouldn’t want to share it with the blog, would you? We’d be so blessed?! I’ll look for it–the hardest part was to get the curve to fit my head so that the ends didn’t jut out like a water buffalo’s horns. I agree with Cindy–Bujold made a very fine Anne. Not classically beautiful, but witty, charming, beguiling. And, of course, with a French accent free of the nasal intonation that characterized the wretched attempt at the part by another well-known actress. you know, I’ve never seen that…or the Norma Shearer Marie Antoinette. btw, do you like how I categorized your blog? La! I must have a birdhouse for my head and be the first person in the State to don one. Very chic. Entertaining post as always. why thank you, my dear. We aim to please!